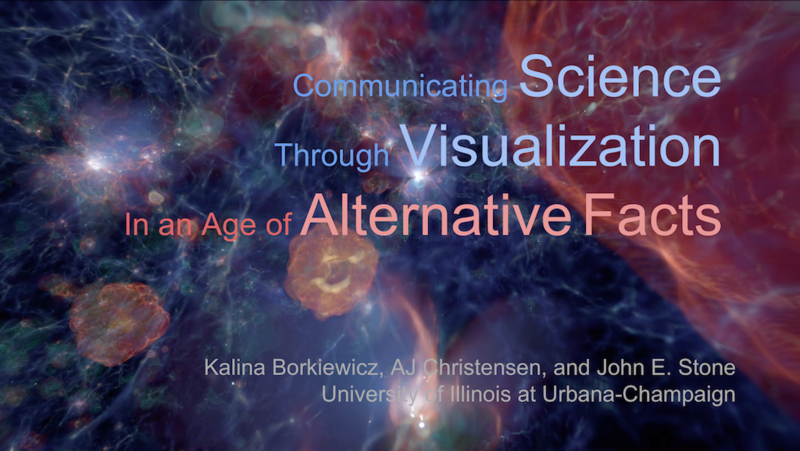 AVL team members Kalina Borkiewicz & AJ Christensen, along with John Stone, a Senior Research Programmer in the Theoretical and Computational Biophysics Group at the Beckman Institute, taught a course at the 2017 SIGGRAPH Conference. "This course thoroughly examines the process of creating cinematic scientific visualizations with professional visual effects tools. It explains the challenges of representing data accurately while making it not only approachable, but also beautiful and compelling to experts and non-experts alike. It summarizes the importance of interactive exploration of data in a virtual environment and performed cinematography in that environment. It explains how artists can leverage tools from the computational-science communities and the necessity of building custom data-translation software. It demonstrates explanatory geometry like streamtubes and field lines, manipulation and registration of correlated datasets, and design strategies for meaningful scenes. It presents arguments for and against visualization approaches like data interpolation and inclusion of illustrative elements. And it clarifies why cinematic scientific visualization is an optimal format for retention of learning objectives and dispelling scientific misconceptions." The course notes are available here.